I shared this content maybe 20 times this year... So, I felt maybe is relevant enough to be included here. At least, the next time I'd need to share it, I will be able to just send the link. The most part of the courses, books or videos I'll recommend in the following notes require to have a pen and paper close to you. I recommend you write down all your insights during each video and each chapter. I suppose the most part of the content recommended here could be relevant for anyone who want to explore the startup literature or is ready to start their own company. But, to be honest, te most part of the comments are addressed to Software Engineer or Computer Science people like me. Usually engineers think the product is just software, we think software is the solution for all the problems, at least problems we want to solve. Sometimes is just for play with new technology, because is cool ... but a business, a product, is more than that, the software is just part of the solution. Sorry guys, I know as engineer that our narcissism tends to push us to believe we're the center... but there's a life "out of the building"
Which are the optimal sectors or customer segments we should address? Which pains we gonna solve? Which is our value proposition? Why us and no the competitors? How we'll generate entry barriers? We'll escale easily the business? He has some books, one of the most popular was probably The Four Steps to the Epiphany where he presented a way to interact with the challenge to create your own business. Steve's blogs is also an endless source of entrepreneur information. One of the most important concepts proposed by Steve is GOOB (Get Out Of the Building) is the philosophy of start as soon as possible to validate your hypothesis interacting with real users and real customers. To be perfectly honest, I didn't read T4Steps4Epiphany, but everybody who talks with me about it, express the same feeling ... "it's hard, it's too hard!!" In that way, Brant Cooper write an executive book, a perfect summary in my opinion, for newbies the Entrepreneurs Guide for Customer Development. He defines clearly the phases the product should achieve, from the initial customer discovery, to the final grow and scale. In fact, Ash Maurya, merge Lean UX, Bootstrapping and Customer Development concepts in his Running Lean book. The main difference between the Model Business Canvas (Steve Blank) and Lean Model Canvas, based on Ash explanation, is the status of the business your are creating. The Lean Model Canvas push you to solve questions for business in earlier stages. But in general both methods push you in create a backlog of hypothesis validation, in order to discover and refine your business, and reduce the treatments. Was a pleasure to participate a few years ago in a Running Lean workshop made by Ash in Barcelona. The videos will help you to complete a Model Bussiness Canvas and also to have a clear overview of the different knowledge areas do you need to explore. I also consider very interesting Justin Wilcox's videos (Founder Institute's founder) at youtube, related to the Customer Development or Customer Discovery lifecycle. Well, I hope this content help you. Anyway, as I mention in my personal blog, I love to help other entrepreneur... the last years was part of my achievements to help at least 2 o 3 entrepreneurs in their business model definition. So, if you want some help please just let me know. In the last few months, in this blog, we had touched on various ideas attempting to land the concepts behind context aware applications and various reasons that might make the notion a fundamental construct of the way we relate to technology. So far we had looked at Joseph Pine value chain, and ideas around what constitutes an authentic experience. Before, in a very interesting play, Ivan took the notions presented in “The Age of Context” and merged them with Thomas Wendt point of view, and speculated with mobiles being at the centre of the equation. "We have thus moved beyond the theorization of our mobile devices as a type of prosthetic to our bodies — an extension of ourselves out into the material world — but instead have to conceive of our devices as absolutely integral to the very foundations of embodied space in the digital age.” (Jason Farman). Is is not difficult to see how this statement, almost a prophetic claim - although taken a "bit out of context," since the original quote referred to the relation of maps and LBS. Regardless, it is clear in Ivan's evolution of the original idea that now, by combining a Mobile experience with the forces introduced in “The Age of Context,” we can start thinking about an initial model of what a context aware app might constitute. As my colleague Robert Palmer put it, in this model the App is "the Agent” that by running in the user’s mobile device, connects him to to a particular context permitting the creation of new level of UX never seen before, a new level of customisation of a service. UX practitioners often talk in terms of journeys to illustrate how and idea goes beyond a static mock. Similarly, I propose we look at one to illustrate how this model works. After seeing in my social feed that some of the user's friends are changing cars and realises that it might be time to change it as well. Curious, the client goes to the bank’s App on the way home from work to see if there is any info in the topic. From the app he might be taken to the Banks website and maybe asked a few eligibility questions. The journey stops at that point, but it should be possible for the user to go on in his desktop or tablet at home. Thanks to the bank eligibility questions already answered it is possible to do a pre-analysis and potentially be ready to provide the user with a response. If in the near future, the client decides to go to the bank, and at the door the App detects a beacon and lets the bank know that the user is walking in. With those critical inputs, the experience at the the bank, has the potential to be fully customised and tailored to the client. Happy and impressed by the efficiency of the service, the user completes the cycle back at the emotional side of the model: likely going out of his way to share the experience, potentially sparking new journeys for others in the client's sphere of influence. Under this model and by leveraging the various existing system and customising the experience to the client, this digital Bank is strongly signalling the client that the they care, and have created an authentic digital experience for their clients. As a closing thought, Metcalfe’s law states that the value of your network goes up proportional to the square of the number of connected nodes of the system (n2). This is exactly what this model promotes: a mechanism to extract more value from existing infrastructure. What do you think about this simple model? Is is it too simple? I would be happy to hear your thoughts and reactions, please share them. 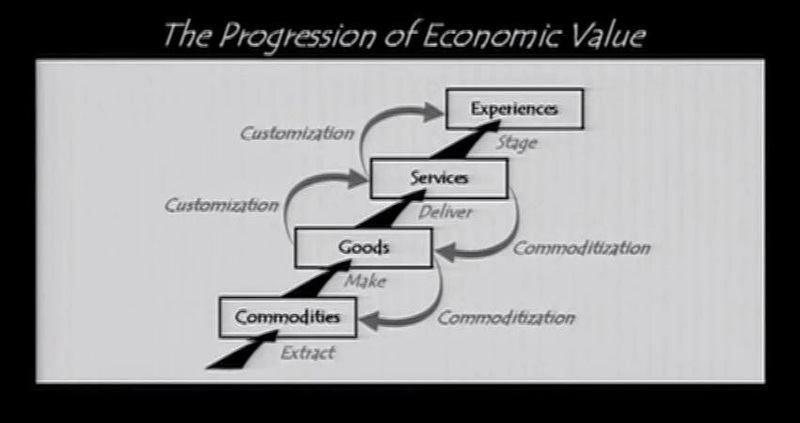 Already 10 years ago Joseph Pine came on stage at Ted and explained to the world the really interesting insight: experiences, or the experience economy as he put it, was the new reference model for Economic Value creation. The reasoning goes that over the last couple of centuries and in particular the last few decades, through customisation, we moved from a commodities based economy to a goods based economy, to a service, and now, to a experience based economy. This would help explain the success of brands like Disney, Starbucks, Apple, etc. More recently, in an interview and related talk, he introduces the concept of authenticity ( or perceived authenticity ) as the ultimate expression of service to a customer and the perfect mechanism to brand-loyalty creation. In other words, what we have is the idea of promoting economic engagement delivered through the customisation of services, to create a memorable or authentic experience that results in brand loyalty. If you think this is a mouthful, it is more obvious than what you might be thinking and can be explained easily by thinking of the efforts of brands like Starbuks, where the will make extensive use of natural material throughout their shops, or coffee beans intentionally left around for you to touch and remind you of how "authentic" they are. In Android, ever since version 4.3 (if memory serves me well) an ever present part of the OS, Google Now, regularly delivers messages (in the form of notifications) based on the different things you do in the google ecosystem: searches that denote interests, emails you receive with appointments, or travel reservations, etc. Google Now notifications, at the time I thought, served mainly two purposes: to further the reach of google services and, as a consequence, to move customers away from other services (or Apps) and into the Google ecosystem. My thinking now is that Google through Now, is achieving a lot more than just moving people their way. Google is delivering in the promise of a customise service and creating a memorable experience through the use of the information they already have... the information that YOU (as a user) know they have and want them to put to good use. Right? Good use you say? Yes, good use: that being the key (IMO) as to why are we so willing to accept what not so long ago we would have seen as an overreach and a threat to our privacy. After all, deep inside we know that this level of service is impossible without someone connecting the dots, without someone doing the math. This "Google Now Effect" is a perfect example of what I would call a Digital Authentic Experience. My last project has been at a bank, helping to put together a tablet solution for Android and iOS. It is really a cool project that is on its way to became a pleasurable experience for many users of that bank. During my time, I had plenty of discussions about the wonders of context base tech, and the potential to build amazing experiences based on Context, in addition I had plenty of time to reflect on the many challenges that the industry is facing at large as they come face to face with a Digital future (a software driven world). So, as part of processing my engagement I wanted to spell out a few of the challenges that most industries (Banking in particular) are facing. Recently I heard an interview from Russ Roberts to Marc Andreessen* and one of the pearls that Marc dropped (and that is so obvious that it almost hurts to think I did not come to the realization myself) is that, with the invention of the Smartphone, in the next few years for the first time virtually every person in the planet is going to have a "personal computer" and to be online. Then he goes on unraveling this seemingly obvious fact, and the implications that it has when combined with the Development culture: the potential reinvention of pretty much every business. Ironically one of the example he talks about is of a Digital Bank that could operate completely from mobiles (no branches), no legacy assets, no legacy systems. Not so long ago, admiringly, I thought of Banks as the last bastions of technologies past. Like a British Museum, banks collect platforms, systems, and technology and keep them running for decades beyond their prime. This forces them to build layers and layers of complexity to get new services up and running while protecting the integrity of the data, the security level, etc. Unfortunately, this amazing achievement, comes both a high economic cost and makes them terribly vulnerable in this Digital world where any banking solution ends up being a work of art that needs "careful curation," severely limiting the pace of internal innovation, and limiting their vision (is difficult to see the forest past the trees). One thing I've come to realise with age is that people/organisations need to be ready to hear and ready to see to be able to share in a vision. Like in the tale of the blind man touching the elephant, it takes touching the whole to have the full understanding of what the elephant is. Unfortunately, great change is fast approaching with a future ripe for innovation in the Banking world, a future where from our many connected devices, we will be able to to we will be able to transact, consult, and interact with our Bank easily and freely. That world is going to happen and my questions for all banks out there is: Are you getting ready for a context driven digital world? You already have the means and assets! Businesses don't trade on anything but information! Yes of course they will occasionally sell you a widget, but admit it, most of the time that you interact with a business is not to get the your hand on the widget, it is about the information it surrounds the widget. So, the easier a business makes it for you to get to be convince and to get that widget in your hands: the happier you will be and the bigger the margin for them. Banks are no different, and would go as far as to say that the bulk of what anyone wants from a Bank is information. Ironically, this is perhaps the most challenging thing for a bank: to quickly provide relevant information. The truth though, is that siloed in the bank is likely an incredible amount of information that should allow them creating amazing experiences. For whatever is worth: you have my permission to help me reach my life goals as quickly and efficiently as possible: Please provide me with an amazing empowering contextually aware banking experience! Roberto C. Serrano - the introduction! A while back I got an invitation from Ivan to start blogging in his house, so, honoured by the offer and compelled by years promising myself that this would be the year I would start blogging, I decided to dive in and blog away. So, lets start at the beginning, first: who am I? My name is Roberto C. Serrano and I am a passionate technologist that, ever since I was 11, dedicated countless hours to indulge my mind in these curious machines called computer. For me, it all started with my collection of micro-hobby magazines dedicated to the infamous Sinclair spectrum, and for years to come I chased the illusive dream of "understanding everything what made the machine ticked". Overtime, understanding everything, gave way to understanding PCs (DR-DOS anyone? ), then understanding programming, then understanding mobile development and software processes, and finally and what made me cross journeys with Ivan: Context aware computing. In a short sentence: my passion is to understand what's at the heart of technology. I started my humble professional journey at the Academia Nuria de Gava (Barcelona) after completing an FP diploma in Computers and Management (Informática y gestión) and quickly went into Multimedia development (remember those pesky CD-Roms?) I developed with some colleagues quite a few for Grupo Z, while teaching people the trade. Eventually we formalised our relationship in Inter. Actividad, a cool Engineering boutique with a focus on providing development services to designers and agencies. We were hot for a while, but it did not take time for our main client in Grupo Z to realised that they would be better off moving the talent in-house, and personally left me a bit disenchanted and ready for the next challenge: to get a more comprehensive education. So, young but already married to a beautiful American woman, around the 2K, we decided to fulfil this higher calling in the US of A, and we left to settled in Chicago. Funny enough an inflating bubble (.com boom anyone?) meant that our goal was delayed 4 years more. During that time, I did my share of Web App development, until I got caught in he eternal cycle of maintaining a poorly design web app (by me), fact that clearly illustrated the need to go back to school! So by 2005 I was full in with a declared CS major in the Engineering program at the University of Illinois, in school while in the process of discovering what takes to become a good developer, I fell in love with all things open-source and dedicated countless hours to learn, Java, OOP, C++, Software Engineering, etc... but spent almost as many hours advocating (and founding the Flourish Conference) - for all of those in the know, I was the guy in the penguin suite! Thanks to the opportunity I spent countless hours expanding my personal network and honing-in my people's skills. More importantly though, I started developing a taste at guessing where tech is heading. This thirst, with time has become an interest in understanding the intimate and transformative nature that technology has on all of us. By 2008, I had already played a little bit with the Android SDK (remember that white blackberry looking thing they had for the emulator?). Little did I know that for years to come Android was going to be the center of my professional life (even today at my present post @ Accenture). Well, remember the network I develop along with Flourish? Upon graduating Motorola came knocking at my door and offer me a role as a Developer Advocate as part of their Linux-Java platform... the platform that would soon after become the central team behind the Motorola Droid. The role was short-lived, since I ended up having my first born just after the first year at Motorola, and ended up moving close to family (darn European customs!). The last 5 years brought about founding a couple Android communities around Barcelona and working in various roles as an Android Developer and more recently as a Project manager. Over the last year, the call to understand the transformative nature of tech., has become a passion for what I personally think will likely be a comparable shift to what mobile started 6 years ago with the iPhone: context aware technologies. As you've been introduced so well by Ivan, here, here and especially here, Context (and Intent), bound in the actions and activities we conduct daily and potentially unlocked through our smart-phones (and other channels) have a transformative power that no other tech has had in at least since the introduction of the iPhone, emergence of Android, and the smart-phone taking over our lives. From time to time, I hope to offer an additional voice and perspective to this fine Blog initiated by Ivan with a particular focus on Mobile, Agile, and Context related tech, especially the latter. So here! This is a quick history of me for those interested in getting to know me. Leave a note if you want me to expand on anything. In the meantime: may love, creativity, and peace always be with you! I'm still surprised after what happened to me this afternoon. I received an e-mail from Google Play about a purchase (Some Game Credits) At first I though it was just a spam/pishing e-mail looking to get my credentials. Later on I entered to my google play account and ... surprise!! I had a charge from a Japanese company ... I looked to cancel the order, but system fails as you can check on the next screenshot. I navigated through the different options at Google Play, and then I saw an extrange device related to my account. That scared me, someone had stole my Google credential. I took another screenshot of the thief's device location, as you can see the thief was located at China. I was still looking the way to request the order cancellation or a money refund when I received a second order. after some weeks of being completely focused on the MWC event, I'm ready to write this new #LetMeDream post. As I wrote in the first one, dedicated to the future FCB stadium. The choice for this one is the Vacation rental portal Airbnb, one of my favorite products. I know that will be difficult to identify opportunities or ways to improve that application, to be honest not only the web, also the mobile solution, are offering great customer experiences. Well, after three days of MWC i have some feelings. The first one: I'm very tired, my legs are completely exhausted. On the other hand I'm very happy, as I answered to the GSMA interviewer today, one word to summarize the MWC is networking... we meet very interesting people and i hope keep in touch with the most part of them. We spent the last three days receiving visitors, listening their needs and pains and trying to provide them our point of view, and how they could adopt the context solutions, how they could adopt big data, sensoring (nfc, ble), omnichannel, lbs and mobile to obtain gains. And the most important, WHY adopt them! We've strong experience providing to our customers (financial industry, automotive industry, utilities industry, retail industry and goverment) strategic advisory to define the right next step without losing the global picture of the future. All the opentrends team expect that all of you considerate relevant our insights. PD: I'm also happy to meet Loki Ng, the co-founder of one of my favorite mobile development applications OneSky as I explained to you in my old post "Mobile Development Survivor Kit"
Let me summarize some yesterday conferences notes. @GibuThomas from Walmart share with the audience very relevant insights about the US market and also the Walmart store strategy off-line and on-line. Well, after months of hard work, we're almost ready to enjoy the Mobile World Congress. We'll wait for your visits on the NFC pavilion (Hall 7) stand 7J20. We've prepared some interesting information about the context solutions our team has developed the last months (Sentilo/Smart Cities, Connected Car, Loyalty/Mobile Consumer, Mobile POS...) You'll also be able to play with some of our product demostration, and some other nice surprises. And also the great job our communication / design team have done. We're proud of you. Great job!! !